Song of the day: What will happen to you and me? My iPad is damaged again. I read an electronic book and as usual I folded a page when I finished for today. Mein iPad ist schon wieder kaputt. Ich habe elektronisch ein Buch gelesen und aus Gewohnheit beim Aufhören eine Seite umgeknickt. 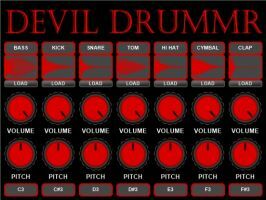 DEVIL DRUMMR 1.0 is a basic drum sampler which you can load your own wave samples into. Photoshop Tutorials with a variety of tools, filters and adjustment layers. All the tutorials have good detail for learn is a great way to learn new post-processing techniques. You will learn how to create an Eerie Eye Photo Manipulation. We will be using blending modes heavily and some standard adjustment layers.